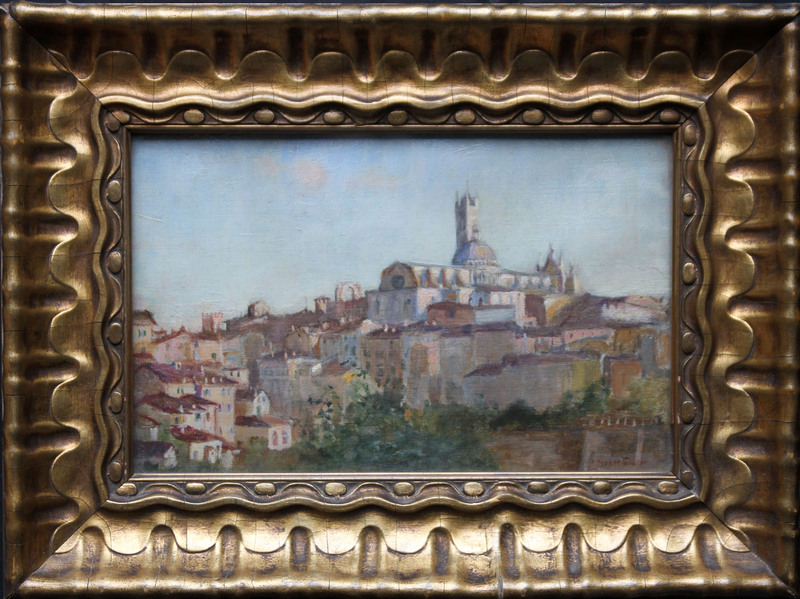 Sienna Italy is an oil on canvas, framed behind glass in its original gallery frame, by Susan Isabel Dacre. A very rare painting, she was an early member of the Feminist movement and a member of the Manchester arts community. She travelled with Lord Leighton and exhibited widely. Indeed this painting retains an exhibition label for Manchester Art Gallery. 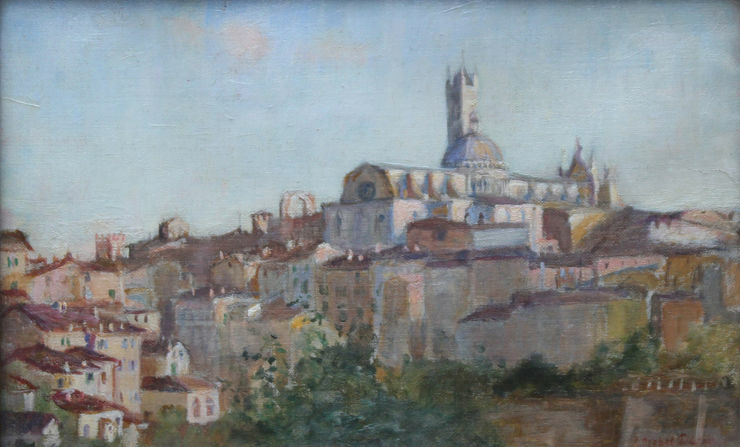 This work shows influences of early British impressionism. The clarity and palette are light and airy. The painting depicts Sienna in Tuscany in Italy. Signed on the right and dated 1901. Manchester Gallery label and number verso. Harnell and Son London Art Dealers. Original 45cm 34 cm original Harnell and Son London Gallery frame. canvas in original excellent condition. Susan Isabel Dacre (1844-1933) was an English female artist of the Victorian era. She was born in Leamington, Warwickshire, and was educated in Salford. For the decade of 1858–68 she lived in Paris. After a winter in Italy (1869), she returned to Paris, and was present during the Franco-Prussian War and the Paris Commune. She returned to England in 1871 and began studying art at the Manchester School of Art, where she won the Queen's Prize in 1875. She began a lifelong friendship with fellow artist Annie Swynnerton; the two women pursued their art studies in Rome and Paris between 1874 and 1880. Around 1872, Lord Leighton dictated notes and observations on his methods of painting and composing his pictures to Susan Dacre, during a stay on the island of Capri. From 1877-1880 she was in Paris at the Académie Julian with a fellow pupil Marie Bashkirtseff and bracketed with her as first in the concourse mentioned in the famous diary. Dacre was associated with Julian’s atelier on two different occasions:1878-1879 when she completed a striking black and white chalk drawing, Portrait of a Young Girl in a Satin Cap, ca. 1879, which is owned by the Andre Del Debbio Collection, Paris. Later she gained her entry to the Paris Salon. For example, her Salon entry in 1881 was a portrait: Portrait of Mme. F.W. (no 579.) ] Manchester Art Gallery own a poignant oil painting Italian Women In Church. Throughout her career her portraits were admired in Italy, England and Paris. After living in London for a time she returned to Manchester in 1883 and shared a studio in 10 King Street with the artist Mary Florence Monkhouse. After much campaigning by both Dacre and Monkhouse in 1897 Dacre was made a member of the council of the Manchester Academy of Fine Arts. At the Royal Jubilee Exhibition, Manchester 1887 she had her work on display, and assisted Ford Madox Brown with the decoration of the exhibition’s dome. Dacre was a noted feminist and suffragette. With Annie Swynnerton she founded the Manchester Society of Women Artists in 1876, Dacre also served as president of the organization. For a decade (1885–95), Dacre was a member of the executive committee of the Manchester National Society for Women's Suffrage.